Combine two favorite desserts with our Lemon Cream Cheese Bars. 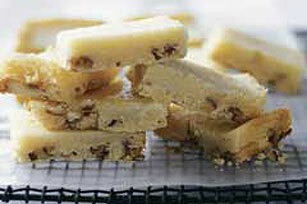 Lemon bars and cheesecake come together with pecans in our Lemon Cream Cheese Bars. Beat butter, 1/3 cup powdered sugar and vanilla in large bowl with mixer until well blended. Gradually beat in 1-1/2 cups flour. Stir in nuts; press onto bottom of13x9-inch pan sprayed with cooking spray. Bake 15 min. Meanwhile, beat cream cheese and granulated sugar in medium bowl with mixer until well blended. Add eggs, 1 at a time, beating well after each addition. Add remaining flour, lemon zest and juice; mix well. Pour cream cheese mixture over crust. Bake 30 min. or until center is set. Cool completely. Sprinkle with 1 Tbsp. powdered sugar just before cutting into bars to serve. Always wash and dry citrus fruit before grating. Move the whole fruit up and down on the side of the grater with the smallest holes to remove ONLY the surface of the fruit peel. (The inner white part is bitter.) Continue to grate the fruit until you have the desired amount of grated peel, rotating the fruit on the grater as necessary. Use a pastry brush or old clean toothbrush to aid in cleaning grater.